(L-R) William Kristol, Donald Trump, Hillary Clinton, Robert Kagan. Neocons, who were supposedly conservatives, endorsed Hillary for president. In these summer dog days of the Trump presidency, good news is hard to come by, but in late June it was reported that the successor institution to William Kristol’s [pro-Israel] Project for a New American Century, the Foreign Policy Initiative (FPI), was shutting its doors for good. William Kristol, Fox News commentator and founder of The Weekly Standard, is a board member of the Emergency Committee for Israel. 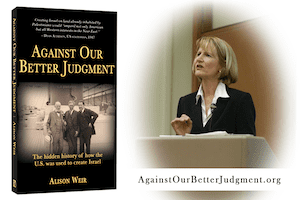 “How Pro-Israel Neocons Pushed for War in Iraq, by Alison Weir.